ENOCH WOOD PERRY, JR. | Geringer Art, Ltd.
ENOCH WOOD PERRY, JR. (American, 1831-1915). Born in Boston in 1831, Enoch Wood Perry, Jr. was a painter known for his portraits — including portraits of the leaders of the Mormon Church — and also an artist known for his early depictions of Hawaii. Perry, known to his friends as “Wood” first studied art in Düsseldorf with Emmanuel Leutze, the famed creator of “Washington Crossing the Delaware.” Perry then studied with Thomas Couture in Paris, and remained in Europe to serve as the U. S. Consul in Vienna. Returning to the U. S. in 1860, Perry established a studio in New Orleans where he executed society portraits. Spurred by the outbreak of the Civil War, Perry left for California in 1862. He accompanied Albert Beirstadt on painting trips to Yosemite, and then travelled to Utah. There Perry sold $11,000 worth of portraits and landscapes over a period of just four months. With his finances in excellent shape, Perry then left for Hawaii at the end of the Civil War. In the collection of the Bishop Museum are his paintings “Diamond Head” and also “Prince of Hawaii” based on the only known photograph of Hawaii’s Prince Albert. 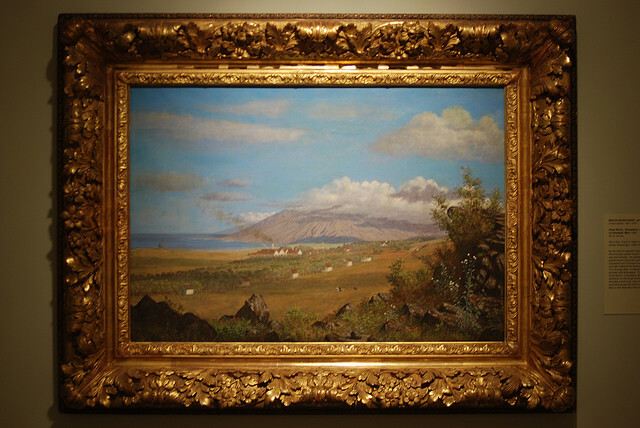 While in Hawaii, he may have taught Edward Bailey who went on to paint many images of Maui after 1865. After returning to the west coast in 1866, Perry continued his lucrative portrait practice, depicting many prominent leaders of the LDS church. He also returned to Hawaii on several trips. Perry was named associate of the National Academy of Design in 1868 and an academician of the Academy in 1869. Enoch Wood Perry Jr. died in New York in 1915.